Proteins are the building blocks of all organisms, and protein-protein interactions are the foundation for cellular structure, metabolism, and communication. Protein-protein interactions range from contacts of protein-complex subunits to dynamic connections among enzymatic signaling networks. Two common techniques to study protein interactions include GST pull-downs and coimmunoprecipitations. Both methods, however, analyze proteins following cell lysis, which typically involves detergents that may cause aberrant protein interactions by disrupting hydrophobic interfaces of protein complexes or by mixing of cellular compartments. Chemical crosslinking of protein complexes in live cells is a powerful way to capture both stable and transient protein-protein interactions in their native environment. Traditional amine-reactive crosslinkers such as formaldehyde or NHS-ester derivatives have been used to study protein-protein interactions in vitro but have varying degrees of success for studying protein complexes in their native environment. Formaldehyde has been used extensively to reversibly crosslink proteins through primary amines with a zero-length bond distance. It, however, spontaneously forms polymers in solution and is not protein-specific as it also crosslinks proteins to DNA and other macromolecules. Bifunctional NHS-ester crosslinkers (e.g., DSG and DSS) are more protein-specific than formaldehyde but only crosslink specific amino acid residues at defined spacer lengths. Additionally, formaldehyde and NHS esters must permeate cell membranes in order to crosslink intracellular proteins and must be quenched to prevent excessive crosslinking. A new method for protein crosslinking in live cells involves metabolically incorporating photoreactive amino acids during protein expression. 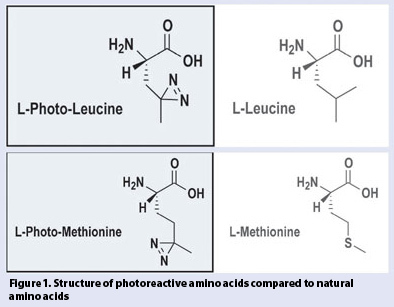 Thermo Fisher Scientific has synthesized two unique photoreactive amino acid derivatives, Photo-Leucine and Photo-Methionine, that have similar structures to their respective natural amino acids (Figure 1). Unlike some amino acid derivatives, these photoreactive analogs are recognized by the endogenous, mammalian protein-synthesis machinery and do not require any genetic manipulation of tRNAs or tRNA acetyl transferases to be incorporated directly into proteins. Photo-Leucine and Photo-Methionine are amino acid derivatives that contain a diazirine moiety for ultraviolet (UV) photocrosslinking of proteins. Photoactivation of diazirines with UV light creates a reactive carbene intermediate that irreversibly crosslinks proteins at any amino acid side chain or peptide backbone with a zero-length bond distance. These compounds allow the researcher to use UV light to irreversibly photocrosslink proteins within protein-interaction domains containing methionine and/or leucine. The photoreactive amino acids are metabolically incorporated into the expressed proteins of actively growing cells by incubating cells in limiting media without methionine and leucine but containing Photo-Leucine and Photo-Methioinine amino acids. Proteins containing the photoreactive analogs readily crosslink upon activation with UV light (365 nm) using a common laboratory UV lamp (Figure 2 and Table). Crosslinked protein complexes can be detected by reduced SDS-PAGE mobility followed by Western blotting. To demonstrate photoreactive crosslinking in live cells, HeLa cells were treated with Photo-Leucine and Photo-Methionine before photoactivation with UV light. For comparison, HeLa cells were also crosslinked using formaldehyde, DSG, and DSS. Treated cells were then lysed and analyzed by SDS-PAGE and Western blotting using an antibody against the homodimeric transcription factor Stat3. Samples were normalized for protein amount and probed with antibodies against GAPDH and beta-actin to verify equal loading. Addition of the photoreactive amino acids did not adversely affect overall protein levels or antibody epitope recognition after Western blotting (Figure 3A). Formaldehyde was unsuccessful in crosslinking any Stat3 dimers and even resulted in reduced Stat3 monomers, most likely caused by decreased solubility of Stat3 after nonspecific crosslinking. For the photoreactive amino acids, crosslinked products were easily observed in UV-treated samples compared to mock-treated controls. The homobifunctional NHS esters DSG and DSS were also able to efficiently crosslink Stat3. They, however, produced dimers having slightly different SDS-PAGE mobility than the photoreactive amino acid-crosslinked product. This difference may be caused by the various amino acids involved in crosslinking: leucine and methioinine vs. lysine and arginine. Consequently, photoreactive amino acids and NHS esters are complementary crosslinking approaches; one or the other may work better depending on the amino acids required for specific protein interaction domains. To quantify and compare the effects of the different crosslinking methods on protein solubility, the protein concentrations of the resulting cell lysates were determined using the Thermo Scientific Pierce® BCA protein assay and normalized to mock-treated controls. 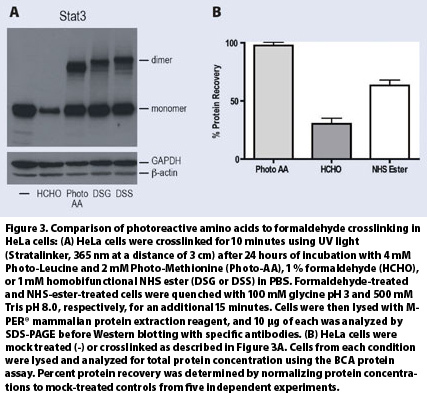 Protein solubility in cell lysates after photoreactive amino acid crosslinking resulted in 95% protein recovery compared to only 35% and 65% protein recovery after treatment with formaldehyde and NHS-ester crosslinkers, respectively (Figure 3B). This result highlights another advantage of using metabolically incorporated Photo-Leucine and Photo-Methionine for crosslinking within protein-protein interaction domains: less charge (pI) neutralization of protein side chains and protein polymerization, which could decrease overall protein solubility. Photo-Leucine and Photo-Methionine are unique, protein-specific crosslinking reagents for use in living cells with the ability to capture more diverse protein-protein interactions with better protein recovery after cell lysis than formaldehyde and NHS-ester crosslinkers. Ryan D. Bomgarden, Ph.D., is research scientist at Thermo Fisher Scientific. Web: www.thermo.com/pierce. E-mail: Ryan.Bomgarden@thermofisher.com.